The OnePlus 5 smartphone was officially launched at 22nd June 2017 at Mumbai location. It is a great news of all those smartphone users who are waiting for latest version of OnePlus 5 smartphone. 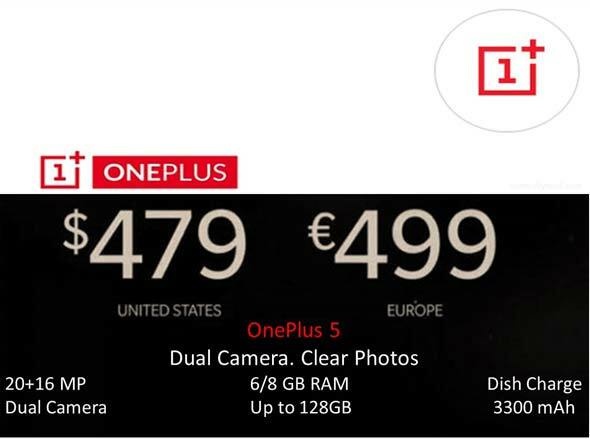 The OnePlus 5 smartphone is priced at USB 439 which is approx at Rs. 32000. The OnePlus 5 dual sim smartphone is powered by 2.45GHz Octa-core Qualcomm Snapdragon 835 processor along with Adreno 540 GPU. This smartphone comes in two variants first is 6GB RAM along with 64GB internal storage capacity. While another variant comes with 8GB RAM with 128GB internal storage capacity. But you must know one thing there both variants of OnePlus 5 smartphone does not have microSD support. The OnePlus 5 Smartphone comes with latest features and stylish design. This smartphone comes with different great features. This smartphone ready to launch in the Indian market at 22nd June 2017. The OnePlus 5 dual sim smartphone comes with a 5.50 inch touchscreen with full HD Optic AMOLED 2.5D curved screen with 1920 x 1080 pixels resolutions. This smartphone comes with Corning Gorilla Glass 5 protection for your latest smartphone. This dual nano sim smartphone running on Android Nougat version 7.1.1 Oxygen Operating System. As per the camera concerned first variant of OnePlus 5 smartphone comes with 20MP rear camera with f/2.6 aperture, Sony IMX350 while another comes with 16MP rear camera with f/1.7 aperture, Sony IMX398. Both variants comes with dual LED flash, 720p@120fps for slow motion, phase detection autofocus, 2x optical zoom, along with 4K full HD video recording at 60fps feature. This smarpthone also has 16MP front facing camera with f/2.0 aperture, EIS Gyro, Auto HDR and Sony IMX 371 feature. This smartphone comes with 4G, VoLTE, WiFi with dual band, GPS, Bluetooth 5.0, NFC, Dirac HD sound, 3 mics, audio jack and USB Type C port connectivity feature. You will also get Finger print, Compass, Magnetometer, Proximity, Accelerometer, Ambient light and Gyroscope sensor. The dimension of this smarpthone is 154.2 x 74.1 x 7.3 mm (6.07 x 2.92 x 0.29 in) which comes with Non-removable Li-Ion 3300 mAh battery with dash charge technology. It’s pretty good smartphone which provide much better picture quality along with different latest features. You just wait for 22nd June when this smartphone launched in the Indian market.